Perfect. Spacious, clean dorms with large lockers and small security drawers. Each bed has power, light, bedside shelf/storage. Towels provided. Bathroom and toilet spotless. Staff friendly and helpful. I was able to check in early after night bus and go straight to bed. Supermarket close, located in centre of city, close to everything. Highly recommended. We really enjoyed our stay at this Hostel. The location is fantastic, a few minutes walk to Old Town. Our room was clean and comfortable and being able to cook in a shared kitchen was an excellent option. A HUGE thanks to the staff Teja and Marie who were very pleasant and helpful. They offered suggestions on what to do, where to eat and even assisted with booking a hire car. We decided to stay an extra night and they were able to accommodate us at very short notice..Recommend this place. 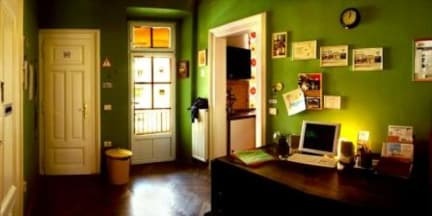 Bright, lovely hostel in a great location with awesome staff. Amazing place, located in the center, thus it isn't noisy at all. The place is cleaned everyday. Staff is very welcoming and will make you feel almost like at home, they can give you too many tips and informations about Slovenia in general if you wanna take a trip around or just discover the city. The beds are quite comfy, you have sheets and pillows plus they can provide towel for free if needeed. The kitchen is fully equiped and you can seat and meet your roommates. I highly recommend it ! We had an amazing time in this hostel! It's easy to make friends and the staff is very kind and helpful. Special thanks to Matjaz :) We will definitely recommend a stay in this hostel, and we will see you again soon! Friendly staff, clean premises, good location. Only one shower, only one toilet, but rarely a wait. Good value. There is only one bathroom and one shower for 16 people. The kitchen is a little bit small, altought it has everything you need. There was no free coffee as they told me when I booked the room. The people from the hostel was very kind and they helped us with everything we needed. Good location and friendly staff. Good place to stay for what it's worth and has a very nice atmosphere.